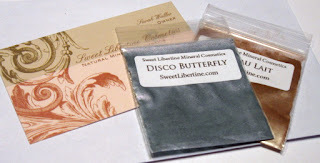 Request free samples for yourself, friends, and family to try Sweet Libertine Cosmetics. Sweet Libertine makes natural mineral makeup by hand. It’s all made by them, no harmful elements or fillers, and it’s great for sensitive skin. You will receive a small package containing two samples of Sweet Libertine’s most popular colors, a business card, and a short note explaining what the program is and why they were sent the samples. The colors sent in the sample packs will be completely random but they will be Sweet Libertine’s most popular colors. They will come in a small sample Ziplock bag®, and will include enough powder for several applications. A sales code will also be included that they can use for a first purchase at Sweet Libertine. Please include an International Reply Coupon, available at your local post office.